The History Girls: THE GATE OF ANGELS by PENELOPE FITZGERALD: Review by Penny Dolan. 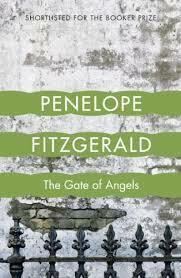 THE GATE OF ANGELS by PENELOPE FITZGERALD: Review by Penny Dolan. This brisk description immediately captured a time when Public Libraries – as opposed to Subscription Libraries - were seen as slightly dangerous places and when books, borrowed by the great unknown public, were once objects of suspicion and possible infection in themselves and not just a worrying way of spreading ideas to the poorer classes. I recall a time when children’s hands and nails were inspected before they were allowed a ticket to borrow books from the library, though that continued much later than the setting of this book. The description above comes from a delight of a novel and a treat of a novelist. THE GATE OF ANGELS, set in 1912, is a work of historical fiction. The author, as I’m sure many of you will know, is Penelope Fitzgerald, and the novel published in 1990. My weak excuse for not having reading her work before is that we share the same first name, which is hardly evidence of a sound critical judgement on my part. In mitigation, Penelope, with all its weight of marital fidelity, is a terrible imposition on a child. Fortunately, THE GATE OF ANGELS surfaced from a pile of dusty paperbacks at about the same moment the title was praised somewhere else. Thank you, revered reader! So I set the battered second-hand copy (“brought to me by Woman’s Journal”) by my bedside. That night I opened the pages and read myself into an unimaginably violent gale, bringing havoc to Cambridge: colleges, townsfolk and landscape alike. What a wonderfully brisk and compact piece of writing it is, sharp as the East Anglian wind. The tightly witty prose carries a strong sense of the author’s voice and a world-sharpened understanding. She does not offer history as a sentimental or stirring recreation but writes with an observant, lively bustle, choosing a moment when all manner of social relationships, newly proposed scientific theories and religious beliefs were there to be questioned. The plot is about a romance that strikes Fred Fairly, a brilliant young physicist and Fellow of the all-male St Angelicus College in the middle of his anxieties about the great debates about science, mathematical certainty and philosophy of that time. Fred’s life is clearly one of upper-middle class privilege, although his sisters nicely conspire to keep him in his place. There is a wonderful scene near the start where Fred returns home to his father Rectory, only to be greeted by a roomful of women – his mother, siblings and the housekeeper – too busy to pay him any attention because they are all sewing suffragette banners for a next march. Fitzgerald may have inherited a sense of that time as she was born in 1916 and grew up in the Archbishop’s Palace in Lincoln. Her mother, an Archbishop’s daughter, was one of the first women students at Oxford and her father was editor of Punch. The famous Knox brothers: the theologian and crime writer Ronald Knox, the cryptographer Dilwyn Knox and the biblical scholar Wilfrid Knox – were her uncles and also the subject of one of her biographies. 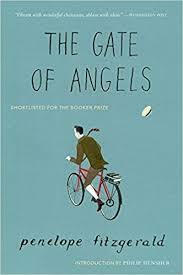 At the start of THE GATE OF ANGELS, the amiable Fred has lost his Christian faith; he is also rather lonely while knowing that, by the terms of his Fellowship, he is forbidden from marrying, particularly women of an unsuitable nature. Quiet moments of humour illuminate his bleak bachelor life. Fitzgerald reminds us that, being brought up in a Rectory, Fred can withstand the lack of heating within the dank, damp Saint Angelus. Fred endures. However, as he cycles up a country road, a horse and cart charge out from a farm drive and two – or was it three? – cyclists collide with the vehicle. Due to a misunderstanding, the unconscious Fred Fairly and the bold and practical heroine, Daisy Saunders – also unconscious - are lain down close together in the same room. Waking so physically close to this warmly attractive young woman, Fred is overcome with love and tenderness: how can he not dream of marrying her? “Fred, quite honestly, did you never take a girl out before?” said Daisy. “She mayn’t have known that though,”said Daisy. Alongside, the reader hears the story of Daisy’s life and her hand-to-mouth childhood, flitting with her ailing mother through the mean terraces of South London. She is definitely not of Fred’s social class. Orphaned at sixteen, Daisy has tried to find and keep clerical jobs, despite horrid yet understated male harassment. Despite all this, Daisy’s energy and confidence are bracing; one is cheered by her practical, pragmatic and rational self and feels for her when, having reached the status of a nursing student, things go awry. In Fitzgerald’s world, I suspect things often go awry. Although the couple enjoy a short relationship, that third cyclist’s disappearance leads to local rumours, to donnish tales of ghostly haunting, and on to word of a concealed murder and finally a full-scale investigation of witnesses and an uncovering of a very awkward truth for Daisy and poor Fred. Even so, just as all seems collapsed into catastrophe, Fitzgerald ends the novel with a moment of hope: just a glimpse of brightness rather than any confirmation, a small optimism that breaks out despite all one expects, and typical of the mix of dark and light that made this novel so very different and such an unexpected surprise. 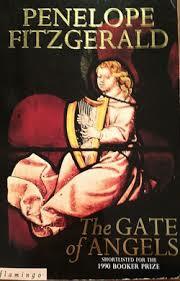 THE GATE OF ANGELS is the third of what are considered Fitzgerald’s four history novels. I have looked at descriptions of the other three novels. The first, INNOCENCE, is set in Florence in 1950, is a romance between an impoverished aristocrat’s daughter and a doctor from a communist family and introduces the Italian Marxist Grammaci. The second, THE BEGINNING OF SPRING, is set in 1913 and describes the world just before the Russian revolution through the struggles of a British businessman and his family living in Moscow. Her fourth and final historical novel, THE BLUE FLOWER, was published in 1955, and is about Novalis, an 18C German poet and his love for an odd child; the poet Goethe and philosopher Schlegel also appear in the novel. Now I cannot say that the content, as described above, would have made me hurry to take these novels off the shelf – especially with my afore-mentioned name phobia - but if the pages have anything of the skill, flavour and bright, quiet wit of Penelope Fitzgerald’s THE GATE OF ANGELS, I am sure these novels will be a delight too. Moreover, as much of Fitzgerald's work has been newly published by Fourth Estate, it will be quite possible to find out. Note: Fitzgerald’s earlier books were inspired on her own experiences: THE BOOKSHOP reflects her knowledge of helping to run a bookshop in Southwold; OFFSHORE draws on life among the houseboat community in Battersea; HUMAN VOICES comes from her war-time life at the BBC while AT FREDDIE’S depicts life at a drama school. Then, feeling she had written out her own life, Fitzgerald began writing about other places and other times. She said she enjoyed the research more than the writing. She died in 2000. Thanks for the book recommendation, Penny - I'm also a newcomer to the other Penny's work, for new reason at all! Wonderful review, Penny. Makes me want to flit over to Amazon and find it straight away. The novel's short and quietly quirky, and I really liked P.F's unique voice and attitude, Sue. Hermione's Lee's biography of PF sounds interesting too, if you like oddly bohemian lives where there's little bright glamour involved. Thank you for this, Penny - like Susan, I shall look for it on Amazon!